Finding the perfect pair of denim jeans is perhaps life’s biggest fashion challenge (right up there with the elusive “perfect” swimsuit). Keeping them looking like the first day you met is easy when you follow these quick tips. Raw vs. Pre-Washed. Knowing the difference between raw (never been washed) and pre-washed denim will help you take better care of your jeans. Pre-washing helps maintain the original shape and makes for fewer problems when cleaning. Raw denim, which is darker in color, may shrink slightly when put in water. Although raw denim jeans can take months to break in, many avid traditionalists believe that the natural creases and snug fit to your body contours are all worth the wait. Limit Washing. Jeans don’t need to be washed after every wear. In fact, as long as your jeans aren’t stained, you can wear them multiple times before they need to be cleaned. Generally, you should wash your denim after 5-10 wears. To avoid the washer when you do have a small stain, spot clean using a damp cloth or an old toothbrush with a mild soap . Inside Out. 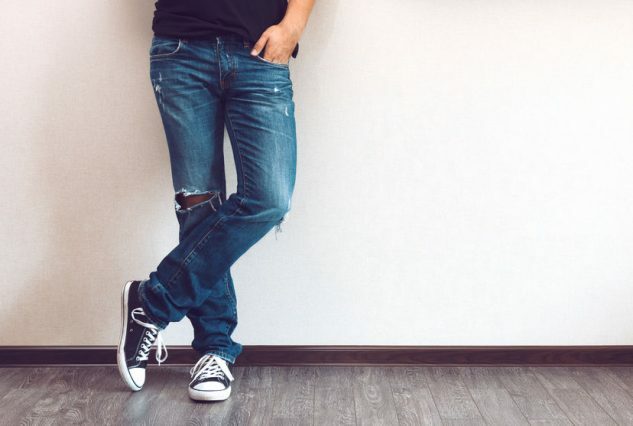 When it is time to throw your jeans into the washer, turn them inside out to prevent excessive fading and color loss that can result from spin cycle agitation. Remember to check your pockets for pens and unroll the cuffs so dirt and sand do not get trapped in. Avoid using harsh soaps as they tend to wash out the indigo blue tint of the denim. Cold Is Cool. Choosing a cold-water spin cycle and a detergent made for cold-water cleaning is added protection against fading and shrinking. The heat in your dryer is your blue jeans’ number one enemy so air dry instead. You should also keep them turned inside out (and out of the sun) which will not only prevent fading but will also help ensure that the interior pockets will dry. A collapsible clothes rack is perfect for the job. GreenEarth Clean. Whether you have embellished jeans that require a gentle clean or you simply can’t fathom not washing your favorite pair after each wear, drycleaning with a silicone-based solvent like GreenEarth is a great alternative for preserving their look and fit. Unlike the harsh, petroleum-based solvents used by most dry cleaners, GreenEarth is safe to use on all fabrics. Colors do not fade. Fabrics do not shrink. And because Best only uses GreenEarth for dry cleaning items, all you have to do is let us know that you want your jeans dry cleaned, not washed, when dropping them off.